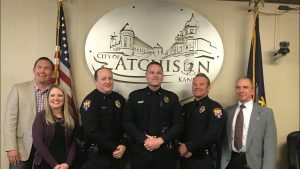 Three Atchison Police officers were promoted to the rank of Lieutenant during a pinning ceremony Monday at City Hall. 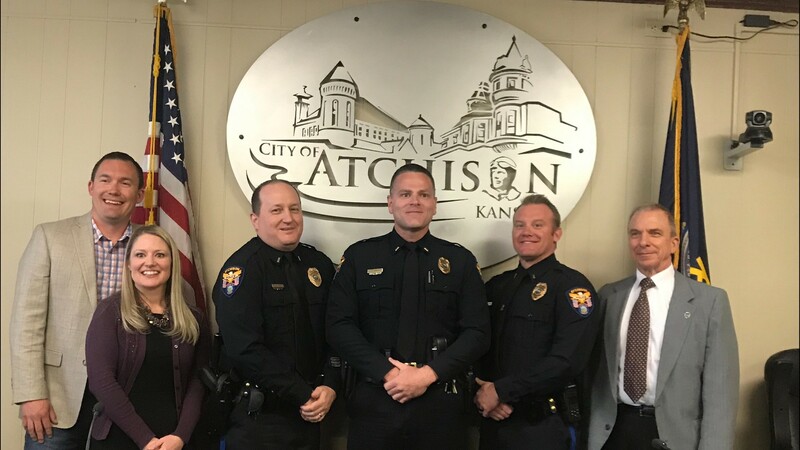 Travis Eichelberger, Al Kelly and Kory Webb each earned gold bars and will provide leadership over separate divisions of law enforcement as the Atchison Police Department undergoes a slight modification in structure with the retirement of Captain Cary Stone in March. Eichelberger is a 12-year member of the force. An Atchison native, Eichelberger was promoted from the rank of Detective. He will lead investigations for the department. Kelly is a 20-year member of the department. Originally from Pennsylvania, Kelly formerly was a sergeant and will lead the department’s patrol unit. Webb has also been with the department for 20 years. Another Atchison native, Webb comes from the rank of sergeant and will oversee special services for the Atchison Police Department. If you have any questions, please call Mike Wilson, Chief of Police, at (913) 367-4323, or michael.wilson@atchisonlec.org.